I had a work trip last month, a couple of days of training in Albuquerque, New Mexico. Flights from Lubbock to Albuquerque are ridiculous, with some of them taking longer than it would take to drive over. So I did the reasonable thing: I drove to Albuquerque. It’s an easy trip from Lubbock and is one I’ve made many times. But in all those Lbb-Abq drives I had never gotten off the highway in Moriarity, New Mexico, to see what was there. It was a bit of a jackpot. Pete’s Bar, for example, was quite compelling. 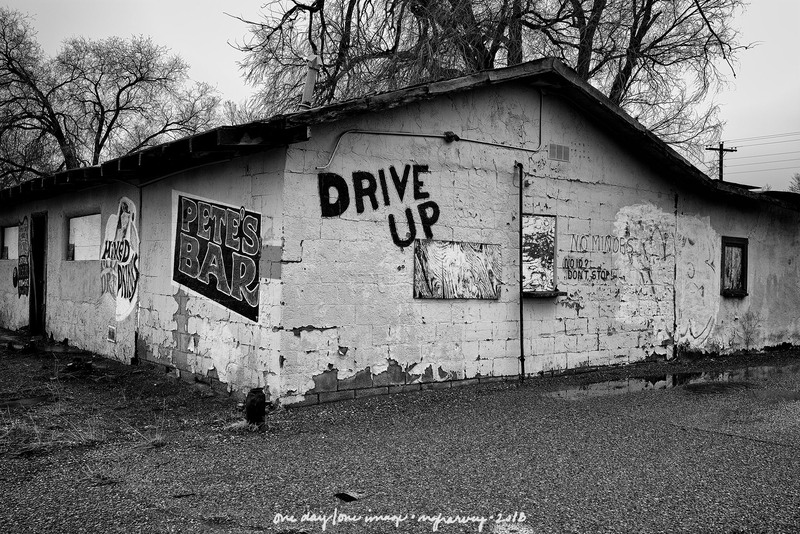 Posted on March 5, 2018, in Photography and tagged 365 photo project, abandoned buildings, black and white photography, learning to see, Leica, melinda green harvey, monochrome, Moriarty New Mexico, new mexico, one day one image, photo a day, photography, postaday, thoughtful seeing, travel photography. Bookmark the permalink. 7 Comments. I actually said “YES!” out loud to myself when I saw this place. Hope you had your ID . Sadly, I did not. I stopped anyway, though, because that’s the way I am. Thanks – it was worth the short detour off the main highway!